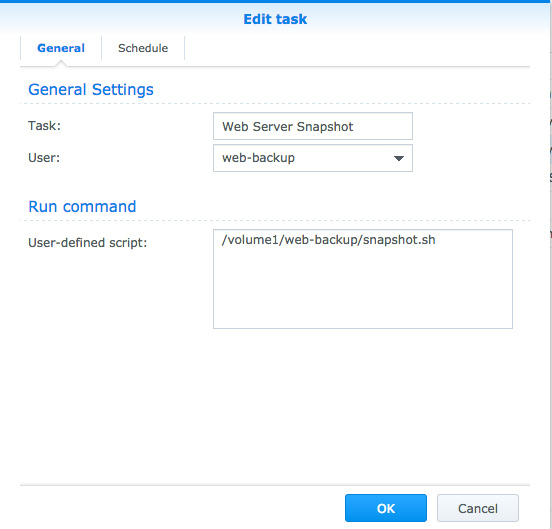 This is a short guide on how to set up rsync on a schedule, to backup and create snapshots of any remote server that allows SSH access to your local Synology NAS. It assumes you have some knowledge of using the terminal and SSH. 1. Set up a user. First I would recommend setting up a separate user in Synology as this allows you to enable things like speed limit controls for the user, but you could do this process under the root/admin user if you wanted. Via the control panel File Services > FTP > SFTP > Enable SFTP service, then open up a terminal and try SSH into your NAS e.g ssh root@mynas.com or ssh root@my.local.ip, enter your password and you should be logged in, if you aren’t or nothing happens check you have port 22 open on your firewall and that it’s forwarded to your NAS. When you’re finished editing press ESC and then type :x, press ENTER. I would also recommend changing the home directory (/var/services… as pictured above) to a different folder that sits in the root e.g /volume1/web-backup and adding the new user full access to this folder. As I had problems using a folder inside /homes so from here on in I’m assuming you have changed it to a folder in the root e.g /volume1/web-backup. cat ~/.ssh/id_rsa.pub | ssh user@123.45.56.78 "mkdir -p ~/.ssh && cat >>  ~/.ssh/authorized_keys"
Now try SSH into your remote server and it shouldn’t prompt for a password, if you get an error about permissions here’s how to set the correct permissions. .ssh directory permissions to be 700 (drwx——) and the public key (.pub file) to be 644 (-rw-r–r–). Your private key (id_rsa) should be 600 (-rw——-). First try a test rsync, don’t worry this is a dry run as in it won’t actually copy anything. It’s a permission problem check the folder your trying to write to the local folder on your NAS has the owner as the user your running rsync under in this article “newuser” is the owner of web-backup. If all this runs smoothly you need need to create two files in the root of your web-backup folder. In my case I store my MySQL backups in a seperate location so there’s a second command to get those too. This creates a .tar archive of the /www directory and puts it in snapshots. It also checks for archives older than 120 days and removes those. You could add another snapshot for your mysql data. Finally simply add the tasks in Tasks > Task Scheduler make sure they run under the user your created at the start of this tutorial. Missing something from this article? Please let me know and I will add it to the article. Great article! it is simple and easy to understand. Any idea how to add email notification for task completion ? I was using your script for a year successfully, it stopped working after upgrading to DSM6 due to reset of configuration changes in /etc/passwd. Thanks! Excellent tutorial which finally helped me to set up a backup process. Before this I was pulling my hair off with connecting Synology to my webserver as my router was not on the short list of supported routers for automatic port configuration. I struggled with the setup for several days with no luck really connecting my Synology to neither Windows or Linux server.